C.L. Ox Gara uses his expertise in tour, concert and event management to present the Allied Forces Foundation, Inc. and the AFF Pipes & Drums in the best professional manner, and to ensure continuity of service to supporters of the cause. He is committed to educating the public about the allied efforts joining those of the United States’ forces abroad. Ox served for 6 years as scout section leader and armored vehicle crewman in the 26th Cavalry Regiment. Today he is the Assistant Technical Director of the Hartt School of the Performing Arts at the University of Hartford. He draws on over 25 years experience in the entertainment production industry, from short tours to large venue management. 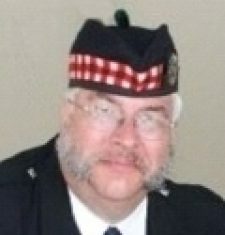 He is also a military and weapons advisor to the trade, and is honored to be the Drum Major of the AFF Pipes & Drums.